ANTIEXPOSURE COVERALL Antiexposure coveralls are composed of several garments that protect you against exposure in cold water. The two main coveralls are the constant-wear and the quick-donning. The constant-wear suit consists of a waterproof outer garment worn over a ventilation liner and/or cold weather underwear. Constant-wear coveralls provide additional protection from cold temperatures. The quick-donning antiexposure coverall is carried in the aircraft and donned only in case of emergency. It consists of a waterproof outer garment equipped with permanently attached boots and wrist and neck seals. An inflatable hood and antiexposure mittens are stowed in the pockets. In case of emergency, the coverall is donned over the regular flight clothing (fig. 11-5). Either the continuous-wear or quick-donning antiexposure coverall is provided for flight personnel and passengers when there is a significant risk of crashing in the water, and when any of the following conditions exist: 1. The water temperature is 50°F or below. 2. The outside air temperature (OAT) is 32°F (wind chill factor corrected) or below. If the water temperature is between 50° and 60°F, the commanding officer of the unit concerned considers the following search and rescue (SAR) factors to determine if antiexposure coveralls should be worn: 1. The maximum probable rescue time. This should be a function of mission distance, SAR equipment, and SAR location. 2. The lowest temperatures that will occur in the mission area during the time period of the flight. 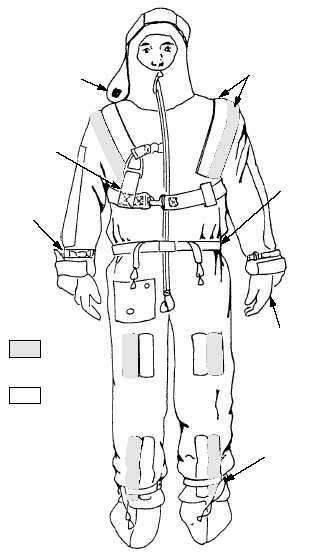 When water temperature is below 60°F and antiexposure coveralls are not required, the flight equipment must include antiexposure and high- 11-4 SILVER REFLECTIVE TAPE RED-ORANGE REFLECTIVE TAPE ANKLE CINCH MITTEN/GLOVE ASSEMBLY WAIST CINCH REFLECTIVE TAPE FACE FLAP HELICOPTER HOIST STRAP WRIST CINCH ANf1105 Figure 11-5.Quick-donning antiexposure coverall. 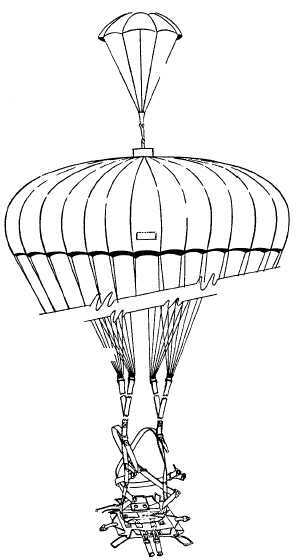 HARNESS PACK SUSPENSION LINES CANOPY PILOT CHUTE ANf1106 Figure 11-6.Five major components of a Navy parachute.